The cocktail that comes first alphabetically in Lommebogen, and also matches my triple-book criteria, is the Blackthorn. This first one is a doozy. Let’s start with the name. Axel has it written down as Blach Torn. Torn is thorn in Danish, and generally Danish isn’t good with “th” in words. When I was looking at that one during the initial cross-referencing it took me a few minutes to realize that he was referring to the Blackthorn cocktail because I was just taking the name at face value. Now, once I sorted out that it was indeed the Blackthorn, we hit complexity number two in that there are two distinct versions of the Blackthorn. Lommebogen has something in the main Blackthorn category, along with Savoy, which uses whiskey. The Café Royal has what is today sometimes known as the Blackthorn #2 version, which uses sloe gin. So we have two variations of the cocktail, and then there was a pretty big difference between Lommebogen‘s version and the Savoy version. I then also tacked on a modern take on the classic cocktail that Gary Regan created, the Blackthorne (note the “e” on the end). The history of the drink and name is pretty interesting, and you can read more about it over on this fine 12 Bottles blog post. At the end of the day, for this single cocktail, I actually had four drinks. I do this for science, and for you, my dear reader. The sacrifices I make. 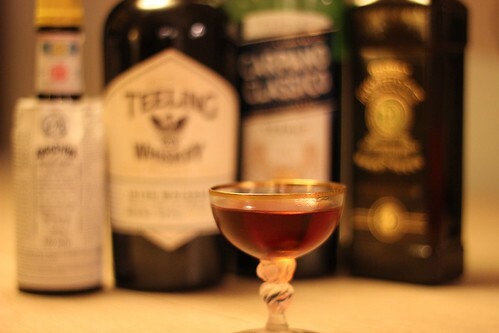 “Whiskey” is pretty broad, and since other recipes specify Irish whiskey, that’s what I used. I used absinthe instead of Pernod because I don’t have Pernod, and I dislike anise-flavored drinks enough that I don’t want more of them in my bar than absolutely necessary. I used 3 dashes of bitters, and I had seen a variation of this where someone did an absinthe rinse, which suited the drink well and meant I didn’t get too high a dose of absinthe (ew). I have homemade sloe gin which is a little more tart than a lot of commercial varieties. All of these are stirred with ice and strained into a cocktail glass. Regan’s Blackthorne also gets garnished with a lemon twist. After working my way through all of these cocktails I’m most likely to go for Lommebogen‘s version or Regan’s Blackthorne. I’m not as big a fan of dry vermouth as I am of sweet. I felt like the Savoy recipe with the dry vermouth highlighted the absinthe more as well, which made it less my cup of tea. In addition, for some reason the bitters also seemed out of place for me. Overall the Savoy version was my least favorite, and downright bleh. Regan’s is more like a Manhattan with the higher whiskey content. Not a bad thing. As for the Café Royal, which is so different from the other whiskey-based three, I was surprised I didn’t like this more than I did. I love sloe gin and I like sweet vermouth. This drink is OK. Something about it just doesn’t seem to highlight either properly for me. Certainly a fine drink, but I have more interesting ways to use sloe gin. This post is part of a series working through some of the cocktails in a Danish bartender’s notebook from the 1930s, Lommebogen.